What wine to drink with a vegetarian meal? All those rules about red wine with red meat, white wine with fish, etc. don’t seem to apply if there’s no meat in the dish. First, rules are meant to be broken. Second, the rules-which-are-not-rules that I use have as much to do with the preparation of the dish, who you’re eating with, and what bottle is sitting there calling your name when you open the wine fridge, as with the nature of the meat itself. From that perspective, those rules would apply to vegetarian dishes as well. Heavier dishes get a red wine, lighter get a white wine, have fun, and open an interesting bottle. 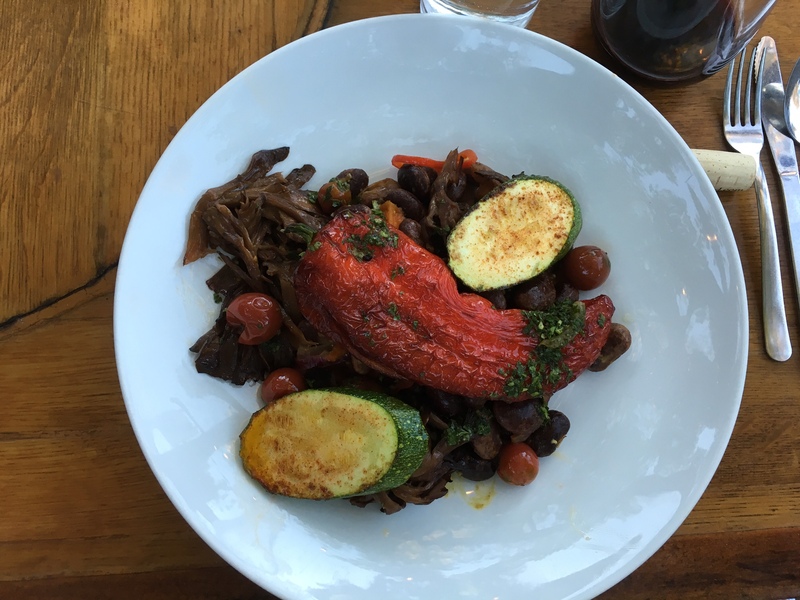 We tried a new restaurant in the Russian River Valley a few weeks ago: Backyard in Forestville. It was great sitting outside on a warm evening and enjoying a very nice meal. For me, while I am not a vegetarian, occasionally that’s the dish on the menu that appeals to me. 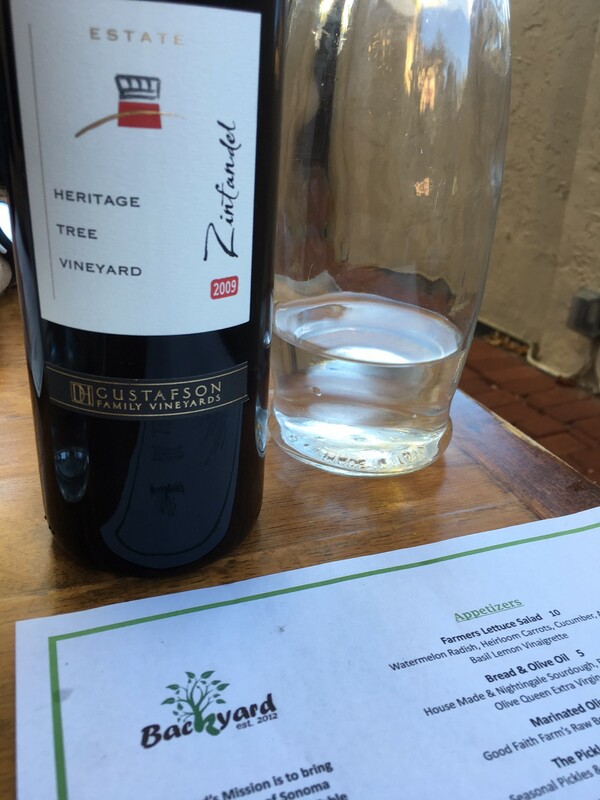 We had brought a bottle of Gustafson Family Vineyards 2009 Zinfandel, Dry Creek Valley, Heritage Tree Vineyard, not because we knew what people were having for dinner, but because it was about time to drink this bottle, and we had some family joining us that would appreciate this wine. The vegetarian cassoulet (a French meat and bean casserole), with mushrooms providing the flavor and texture instead of meat, had big flavors, and larger pieces/texture from the normal cassoulet ingredients. It turned out that the Zinfandel, which from 2009 was a very good vintage from a very good winery, went perfectly with this dish. The best 2009 Dry Creek Valley Zinfandels (and the Gustafson is one of them) have a softness – well, maybe not softness, but not the big body that is usual in Dry Creek Valley Zins – and complexity that also paired nicely with Lori’s chicken dish that night. By the way, we picked up this bottle on a visit to Gustafson a few years back. It’s the most distant (Northern) of the Dry Creek Valley wineries, but the drive is worth it, both for the scenery of the drive, and for the people and the wine at Gustafson. I’m not sure if that helps with the discussion about wine pairing in general, and pairing with vegetarian dishes specifically, but at least it’s a data point for future reference. This entry was posted in wine-food pairing and tagged Backyard, cassoulet, Dry Creek Valley, Gustafson Family Vineyards, Russian River restaurants, wine-food pairing on October 29, 2016 by vvblogman. 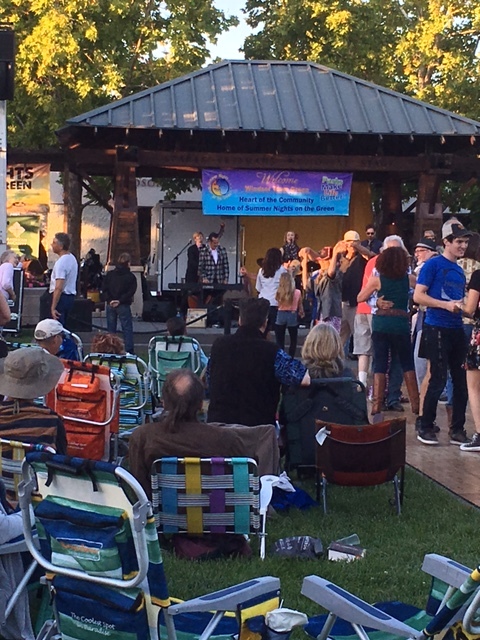 A great thing that’s happened in the last few years, in the small towns of the Bay Area, is adding casual concerts to weeknight farmers’ markets. In our area, our town of Windsor does this, as does Healdsburg, Sebastopol, Santa Rosa and probably others that I don’t know about and haven’t had time to explore yet. For us, the Windsor Green is about a 5 minute drive. It takes more time to find a parking space for the Thursday evening market/concert than to drive there. Most recently, we went and heard a swing band, which had the audience dancing in the square. Swing dancing is not in my skill set, or Lori’s, but we enjoyed listening, and watching the dancers. We also enjoyed the food available from the market, plus there was paella available from Castañeda’s Market, a local market owned by our new neighbors. (To be clear, we’re the new ones in the neighborhood; they’ve been there for a number of years.) If you want paella catered for your event, you should check out their Paella Guy website. This was just such a wine. Grenache is most often used for rosé’s in France, as it has just enough flavor and body to make a good light wine, plus if picked right has the acid to go with foods. This wine reminded me of a lunch Lori and I had at a sidewalk café in Nice, France, somewhere around 2001, which featured a nice bottle of rosé. A great memory from that trip, but also a great new memory made of music, food and wine close to home. 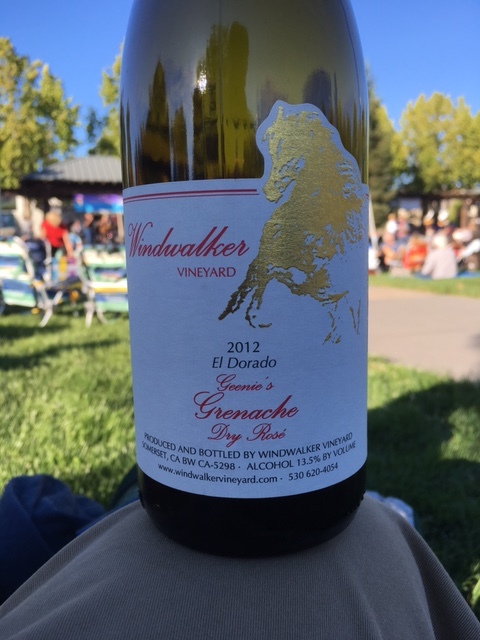 This entry was posted in wine-food pairing and tagged El Dorado County, grenache, rose, Windsor, Windwalker on October 2, 2016 by vvblogman.